Your donations improve the independence of persons with disabilities by providing outstanding access information. 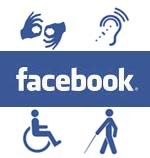 Become a fan of Accessible Virginia. DIRECTIONS: Located in Scott County, VA 15 mi. north of Gate City and 20 mi. from Kingsport, TN via Rte 23 and 58. GENERAL DESCRIPTION: 850 foot long Natural Tunnel. Facilities include a campground, picnic areas, amphitheater, visitor center and gift shop, historical blockhouse, swimming pool and chair lift to the tunnel floor. The park also offers cave tours and canoe trips on the Clinch River. PARKING: 8 wheelchair accessible parking spaces. TYPE OF PATHS: Dirt and rock, do have steep grades requiring assistance for persons in wheelchairs. Paths vary, all under 1 mile except one trail - 1.1 mile to overlook. Trail behind visitor center to scenic overlook is ramped and wheelchair accessible. It is 200 ft. from parking lot. ENTRANCE: At Visitor Center, Gift Shop, and Pool Concession. Ramps provided. Entry doors, 36 in. wide, easily open out with handle located 36 in. above floor. PUBLIC REST ROOMS: At visitor center, picnic area and campground. Doors are 35 in. wide and open in. No turns to enter. Accessible stalls have 31 in. wide doors opening out. 10 in. between commode and wall. Sink height is 26 in. Accessible stall checked regularly for obstructions. Rest rooms are identified by a raised figure with pants or skirt on door to designate men or women. For guests with visual disabilities, there are signs with contrasting background, printed on a non-glossy surface. Tactile exhibits involving wildlife, geology and railroads. For guests with mobility disabilities, the chairlift can be stopped at both terminals for loading and unloading passengers. Wheelchairs and walkers can be sent down in the chair with the individual or in the next chair. The park has a wheelchair at the lower terminal for public use should it be needed or in case the given motorized wheelchair is too heavy to load. Staff will provide assistance at this facility in loading and unloading physically challenged passengers. The boardwalk to the tunnel is level, and guests can wheel to the mouth of the tunnel. There is also an accessible pit toilet at the lower terminal building. Directly behind the visitor center is a hand-railed, asphalt, ramped walkway that goes to the main overlook above the Stock Creek Gorge and the mouth of Natural Tunnel. The overlook is approximately 200 yards from the visitor center parking area. The park features a restored train engine display that has a wheelchair accessible ramp built into it. It is adjacent to the visitor center parking lot. GIFT SHOP: Counters 37 in. high. Clerks assist customers with special needs. Aisles clear of temporary displays. PICNIC AREAS: 1 table for guests in wheelchairs located at Picnic Shelter #4. Table height 30 in. Width of aisles between tables 52 in. Path to and around picnic shelter #4 is concrete. Other covered shelters available, but walkways to shelters are not concrete - mostly gravel, with steps to #1. One of two picnic area restrooms is accessible. It has accessible entry and stalls. This restroom is near shelter 4. Shelter 4, built by the Manville Ruritan Club, features fixed tables designed for wheelchair accessibility. It's about 160 ft. from the playground, 50 ft. from the parking lot and 20 ft. from the restroom. It includes a 36 by 36-inch grill. Shelter 5 is the park's largest, was built by the Duffield Lions Club. It's adjacent to an accessible restroom and accessible from an asphalt ramp. There's a hand-railed walkway approximately 300 feet long. These shelters and restrooms are about 100 feet from the accessible parking spots. Shelter 5 (large - 30 by 60 feet): This shelter, the park's largest, was built by the Duffield Lions Club and accommodates up to 150. There are 20 six-foot picnic tables, two "Texas style" grills, horseshoe pits, a water fountain, electrical outlets, a sand volleyball court and a 230-ft. paved walkway, easing accessibility. It's 280 ft. from the parking area, 230 ft. from the volleyball court, 180 ft. from the restroom and 390 ft. from the playground. POOL: The complex includes a 5,400-square-foot pool, a large bathhouse, and a snack bar in the concession building. The pool bathhouse and facility are accessible. The park has wheelchair accessible tables in the patio of the snack bar and a lift to lower guests from wheel chair into the pool. CABINS: Cabins 3, 9, 10 and 11 are accessible. Cabin 3 and 10 sleeps up to eight with one queen bed, two twin beds in second bedroom and two sets of bunk beds (sleeps four) in third bedroom. Cabin 11 is a two-bedroom accessible cabin that sleeps up to four. It has one queen bed and a set of bunk beds (sleeps two) in a second bedroom. Natural Tunnel six-bedroom lodge is accessible in kitchen, dining area, living room, two bedrooms and one bathroom which has an accessible shower. CAMP SITE: Cove View Campground and Lover’s Leap Campground has electric and water campsites that are fairly level and can accommodate guests with disabilities. They are asphalt pull-through sites with grassy areas surrounding them. The campground bathhouse toilet stalls are accessible. The showers in the bathhouse limited access. There is a ramped entrance to the bathhouse. Electrical and water hook-up. Personnel available to assist with hook-up. Amenities available at camp site include picnic table, fire ring and wood (fee per bundle). Lover’s Leap Campsite 9 is accessible and is near the bathhouse. The site is not reserved strictly for those with disabilities. Because sites are assigned upon arrival, ask park personnel for this site when you get there. HISTORIC BLOCK FORT: The Wilderness Road Blockhouse and Visitor Center, an interpretive area next to the park's picnic area, illustrates the role the blockhouse played in the 1700s during westward expansion of the nation. Hours vary so please call the park for specific dates and times. The park lies along the Daniel Boone Wilderness Trail driving tour. ADDITIONAL INFORMATION: Accepted credit cards V and MC. Open: 8 am - dusk. Park fees: www.dcr.virginia.gov/state-parks/parkfees.shtml. Although motorized vehicles are not permitted on park trails, electric powered wheelchairs and electric scooters that meet the federal definition for wheelchairs are allowed to enable people with disabilities to use the trails. There are cave tours and canoe trips down Clinch River for a fee. Group rates are available for caving, canoeing, chair lift and swimming pool. Opening Door, Inc. is a 501(c)(3) tax-exempt, non-profit organization.